If you're looking for a page-turning psychological thriller to read on holiday, you could do worse than Louise Millar's Accidents Happen - if SJ Watson's Before I Go To Sleep is your kind of thing, perhaps. Don't, however, turn to this one for gritty realism: it's not strong on plausibility. The protagonist of Accidents Happen is Kate, an affluent middle-class widow who, after losing first her parents and then her husband in tragic circumstances, has been left convinced that she is 'cursed' and suffering from an anxiety disorder somewhere on the obsessive-compulsive spectrum, constantly running through statistics and probability sums in her head in order to reduce the risk inherent in everything she or her 10-year-old son Jack does. As her anxiety spirals so far out of control that her wealthy in-laws are concerned for Jack's welfare, Kate meets Jago, a professor of maths who has recently published a book about risk in the 'popular science' genre. Jago is certain he can help Kate to overcome her problems with a sort of immersion therapy, encouraging her to carry out what amount to grown-up dares to re-accustom herself to minor risk-taking, and his approach seems to be working. Yet Kate still has a nagging doubt that someone or something may be gaining access to her house, and Jack seems to share the same fear. Are they so consumed by Kate's neuroses that they are seeing dangers where none exist? Or could this be the one and only time when Kate and Jack really are in danger? 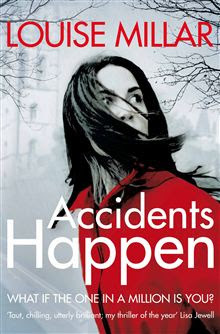 The basic premise of Accidents Happen is an original one, and one that captured my attention right from the start. I could easily see that Kate's problem was entirely credible, given her history, and found her an easy character with whom to sympathise as she tries to do the best for her son in parallel with the well-meant but sometimes stifling input of her late husband's family. Jack, too, is wholly believable: at almost eleven, he's just at the age where a desire for more independence sometimes conflicts with day-to-day childhood doubts over outdoor sleepovers and walks down creepy country lanes. Louise Millar withholds various snippets of information from us throughout the book to keep us turning the pages, revealing something significant every few chapters to keep up our interest and raise our suspicions. Accidents Happen is full of secrets and unspoken family tensions and as such, it's certainly a suspense-packed read. Where I think it falls down is in the characterisation of Jago, who is supposed to be a sufficiently likeable charmer to set Kate's heart fluttering for the first time after her husband's death, but merely came across to me as an insufferably smug pillock from whom any sensible woman would have walked away on date one, and in the ending, which I simply found so implausible as to be almost disappointing. I can't deny that it's been very cleverly worked out, but I just found it impossible to believe and executed at a pace that seemed rushed. I could have accepted how terribly unlikely it all was if it had been revealed more gradually, but having it all thrown at me within such a short space of time did give me, to quote Through The Looking Glass, the sensation of 'believing six impossible things before breakfast'. Accidents Happen (again, rather like Before I Go To Sleep) is a book that benefits from a certain disengagement of one's brain when you read it. Try to forget that none of this would happen in a million years, and just sit back and enjoy it.